Strong coupling is a natural phenomenon consisting in the strong interaction among two or more systems. When this situation occurs, the resulting system manifests very different properties than its original constituent parts. For example, different optical/electronic/vibrational response can be expected. Few applications are nowadays based on this phenomenon but more are expected to come upon a deeper understanding of strong coupling. For example, nowadays it can be exploited to modify the rate of chemical reaction or the performance of fluorescence spectroscopy, either for material of bio-science. In this publication, entitled “The role of Rabi splitting tuning in the dynamics of strongly coupled J-aggregates and surface plasmon polaritons in nanohole arrays” published on Nanoscale (IF 7.4), realized in collaboration with the Italian Institute of Technology (Italy), Louisiana State University (USA) and Jilin University (China), we have addressed this problem by considering different concentrations of one of the two constituent parts (J-aggregates) contributing to the strong coupling. In particular, following both a static and dynamic approach, we have targeted the best condition to maximize the so called Rabi splitting, namely the strength of the coupling. This is in fact an important target as from it depends the possibility of transferring the strong coupling phenomenon from basic science to applied science. In this respect, our dynamic analysis suggests that extra work needs to be done, especially towards the development of a complete model capable of predicting the behavior of this kind of systems upon time evolution. The panel here below describes the occurring of strong coupling between a nanostructured device and a molecule (J-aggregate). It is clear how the resonances associated to these two systems, both responding at about 630 nm (see left figure), disappear when the nanostructured device and J-aggregates molecules are put together, forming two new resonances at around 570 nm and 650 nm (see right figure). The enhancement of this splitting is nowadays an important line of research. Figure: (left) Top corner: SEM image of the nanostructured device. It comprises of a periodic sequence of holes in a gold slab (scale bar 310 nm). The figure shows also a schematic of the overall device, including a CaF2 substrate, the gold layer and the solution with J-aggregates. The resonance of the J-aggregates at different concentrations and the resonance of the nanostructure are highlighted, both falling around 630 nm. 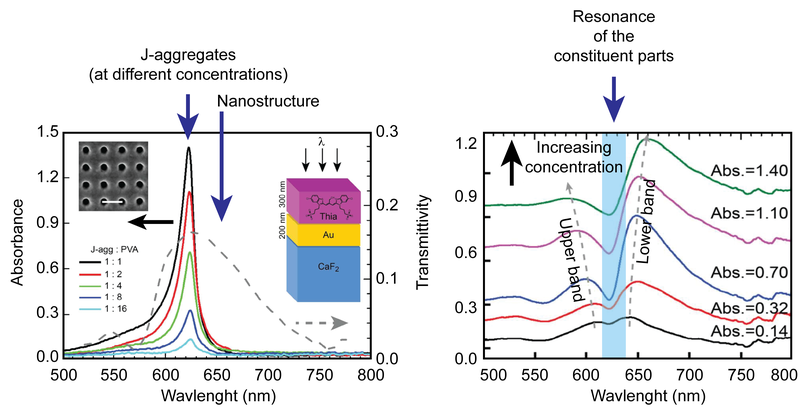 (right) When J-aggregates and the nanostructure are put in contact, a new optical response is generated, with resonances between 570-600 nm (upper band) and between 650-700 nm (lower band), depending on the J-aggregates concentration.